The People’s Republic of China has enthusiastically embraced Western science and technology, and modernity’s materialistic worldview. 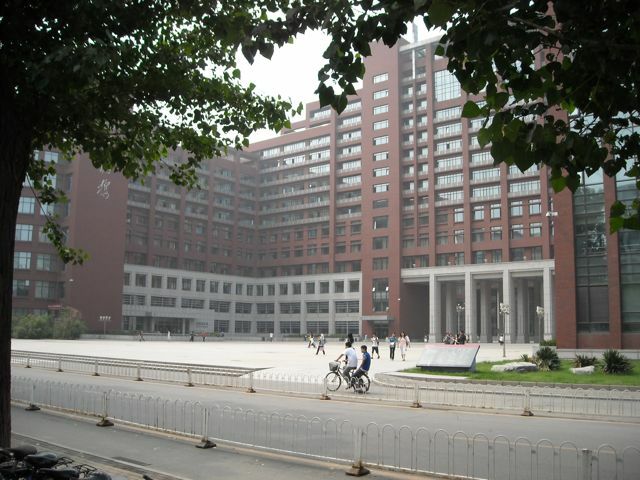 Pictured above is the imposing business faculty of China’s Renmin (the People’s) University. Here this leading Communist university trains a new generation of Chinese business leaders, offering MBA degrees in global economics along capitalist lines. What you won’t find at the university, however, is a faculty of Christian theology. China is still disdainful of religion, and a robust program in theology would only encourage it. But how different it is in the West, right? Well actually, not so much. Christian theology is in serious decline in the West, even in evangelical seminaries and other institutions of higher learning. Pretty soon it may be on life support here as well. There is a reason why theology is atrophying in the West. There’s more to it than America’s growing appetite for the likes of Jerry Springer and other coarsening influences. About a thousand years ago the great medieval theologian Thomas Aquinas tried to harmonize the philosophical wisdom of Aristotle and the revealed truths of his Christian faith. For him, Nature or general revelation (studied in philosophy and science) served as the platform of knowledge, and “Grace” or special revelation (embodied chiefly in Scripture, and studied in theology or divinity) was added to provide what nature was incapable of delivering, due to its intrinsic limits and the fallibility of the human mind to process its latent potential. This was a useful distinction, and one that came to be reflected in the structure of the earliest university faculties and curricula. What divinity lacked in its relative breadth, vis a vis philosophy and science, it made up for by the unique and crucial knowledge it delivered about God and the plan of human salvation. Eventually both Roman Catholic and Protestant education came around to adopting this basic division, as reflected in the modern tradition of a humanities and science undergraduate degree, upon which theology or divinity was added as a graduate level capstone at the Divinity School. If anything, Protestants have given even higher priority than Roman Catholics have to special revelation. Instead of special revelation arriving to fill in the gaps in Nature’s witness, special revelation provides for many Protestants the centering themes and understandings that philosophy and science subsequently develop and flesh out. Thus special revelation, rather than being an add-on at the end, necessary but still rather like an appendix, becomes the orienting framework for everything else. Architecturally, that’s why you tend to find the chapel at the heart of the older Protestant university campuses. And that’s why we still have divinity schools at places like Harvard, Yale, Duke and the University of Chicago. But then came pragmatism—America’s specialty. I don’t want to read too much into mere titles of institutions, but at one time the term “divinity school” conveyed in an intentional way an institution’s commitment to specializing in the study and transmission of the legacy of special revelation. The closely cognate term “seminary” has a more professional and vocational focus—an institution for the training and formation of clergy. St. Mary’s College, where I studied at St. Andrews, has been known since 1411 as the divinity school within the larger university, and I am pretty sure it would be loathe to change its name to seminary, for the reason mentioned above. I suspect that at the seminary where I teach (and where we dropped the adjective “theological” a while ago) we now have a predominantly professional vision of our institutional mission, and in light of that it is debatable whether divinity is still as strong a collective focus. The name we have adopted and the way we operate would suggest that we really are what we call ourselves, a seminary—a professional school in which it is no longer justifiable to regard the study of divinity (the specially revealed things of God) as our primary focus. Instead a “well-rounded” training curriculum should include doses of various disciplines among which divinity would be just one among others—like psychology, cultural anthropology, management theory, etc. What tends to unite the various disciplines in the curriculum is the faculty’s shared commitment to producing a competent and “together” professional minister. For all intents and purposes, I think this is what most American seminaries have become or will soon be. With new, ever shorter and more pragmatic curricula being considered, for marketing and recruitment reasons, by accredited seminaries throughout North America, it remains to be seen what the future of theology or divinity will be. The growing consensus among number-crunching administrators is that an introductory (and quasi-catechetical) survey of doctrine will remain important to the preparation of ministers, but beyond such a minimalist baseline anything deeper is strictly optional. Already theological libraries lie largely idle as seminary students are rarely expected to probe deeper than the contents of their survey course textbooks. Today one is more likely to have an informed conversation about Paul Tillich, Immanuel Kant or even Thomas Torrance in a secular Chinese university than in an American evangelical seminary. If our new schools no longer have time for lively, substantive theological reflection, where will these vital conversations take place? From where will the truly prophetic and culturally relevant voices come? Will there be any home left for theology, or will it become an orphan discipline in the West, as it now is under Communism in the East? It is a great irony, but perhaps the very thing that ideological opponents of Christianity in Asia are seeking to achieve through the suppression of a discipline is being quietly and effectively accomplished in the West by surrender to market forces and evangelical indifference to the life of the mind.